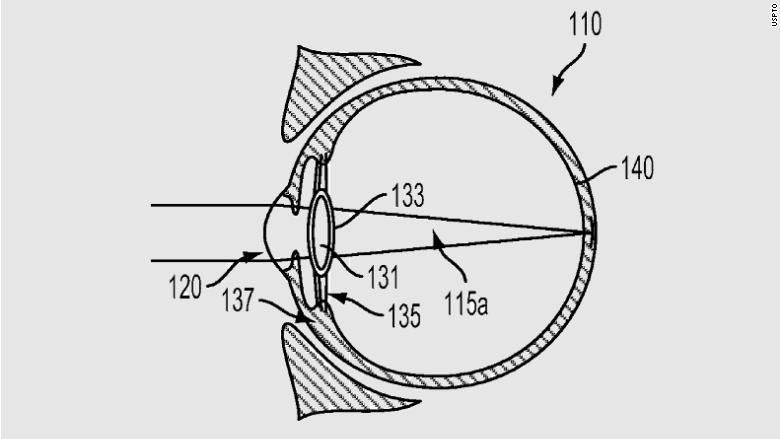 Google's new patented electronic lens would be injected into your eyeball. The company has been developing smart glasses and even smart contact lenses for years. But Google's newest patented technology would go even further -- and deeper. (Note: the squeamish should skip to the next paragraph.) In its patent application, which the U.S. Patent and Trademark Office approved last week, Google says it could remove the lens of your eye, inject fluid into your empty lens capsule and then place an electronic lens in the fluid. Google says that its patented lenses could be used to cure presbyopia, an age-related condition in which people's eyes stiffen and their ability to focus is diminished or lost. It could also correct common eye problems, such as myopia, hyperopia, astigmatism. Yet Google (GOOGL) noted that privacy could become a concern. If your computerized eyes are transmitting data all the time, that signal could allow law enforcement or hackers to identify you or track your movements. Google said that it could make the mechanical lenses strip out personally identifying information so that your information stays secure. Before you sign up for cyborg eyes, it's important to note that Google and many other tech companies patent technologies all the time. Many of those patented items don't end up getting made into actual products. So it's unclear if Google will ever be implanting computers into your eyes -- soon or ever.